The Essex SSCA gam is a success! I feel like it’s been ages since my last post. After putting something up a few times a week when we were away, I have to admit that I find it hard to find stuff to write about when I am home doing chores, like cutting the lawn. Having said that, I do like the mix of shore and afloat. However, a major time sink over the last few weeks was getting ready for our first Seven Seas Cruising Association (SSCA) Gam here in Essex which we had for three days over the weekend. When Brenda and I traveled down the Intra Coastal Waterway (ICW) last fall we took advantage of a terrific benefit of the SSCA, their “Cruising Stations”. These “stations” are provided by members of the group that live in areas where cruisers pass by. These folks agree to take members out to get groceries, marine supplies and other necessities when they stop by their area. Last fall, prior to heading south, Brenda and I signed up to be the Essex Cruising Station with the goal of helping out fellow cruisers who visit Essex. SSCA also has a number of Gams or meetings on the east Coast including one in Annapolis in September, November in Melborne Florida and an informal one day gam in Isleboro Maine in August. 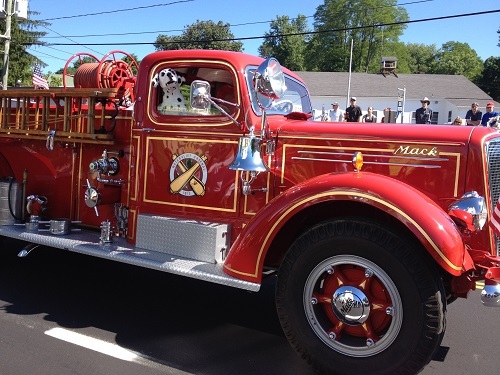 It seemed to me that hosting a Gam here in Essex to connect with cruisers who are headed to Maine for the summer would be a good idea, and fun. After much discussion about dates, we settled on late June. So, how did the first Essex Gam go? Thanks for asking. It went very well, thank you. The “event”, with a total of 35 participants was held over a three day period, with something happening each day. 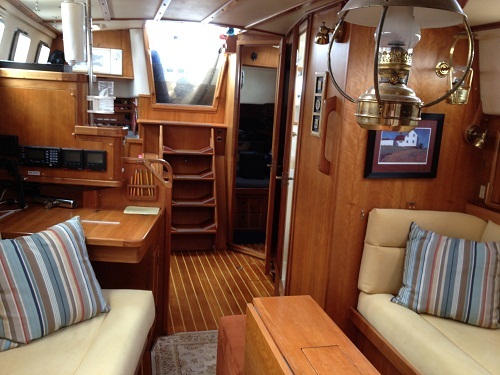 While all attending spend time cruising, on small boats and a number of them live aboard, one couple, Harry and Jane of Cormorant, just returned from a 15 year circumnavigation aboard their 39′ Corbin. What a nice couple and how interesting to hear about their journey. I hope to have them speak to our group next June. However, given their vagabond life, who knows where they will be in a year. Actually, you can read about their travels on their blog. I have not read much yet, but it’s got to be great reading. Don’t they look like nice folks? Photos don’t lie, at least this time. 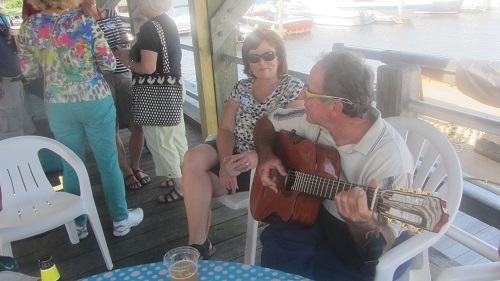 We kicked off our Gam with a cocktail party at the Essex Yacht Club, where Brenda and I are members, on Saturday June 22nd. I thought that having an informal cocktail party to kick things off would be fun, and it really was. Here’s me calling the group to order to announce the weekends itinerary. 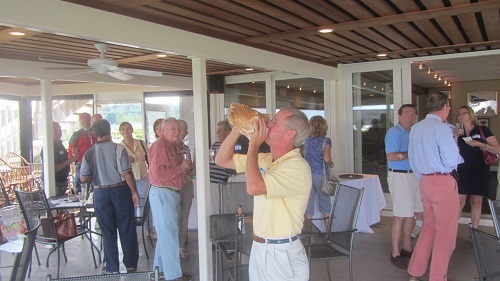 After years of getting folks attention by banging a spoon against a wine glass, in my previous life, it was so great to blow my conch horn. So much more “cruiserly”. I am happy to report that I blew it pretty well even with the pressure of an audience. I am just so “mature” these days. On the next afternoon, Sunday, we had a potluck supper at the Essex Corinthians Yacht Club, next door. That club is a little less formal than EYC where a pot luck, because EYC has a full service kitchen, wouldn’t work. An SSCA member Ted, who lives aboard, brought along his guitar. On top of the group that came to the cocktail party on Saturday, a few late comers joined the group. The weather was perfect and we had a terrific time. 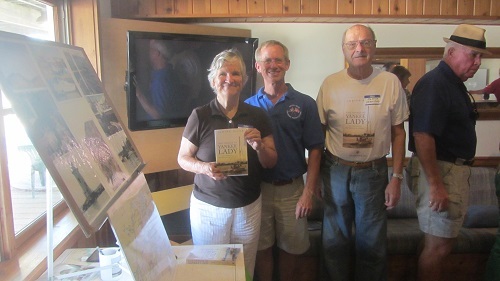 We also had a speaker, Judy Silva who has just published a book “The Voyage of the Yankee Lady” an account of her voyage with her husband Jim up the Hudson River, into Lake Champlain, into the St Laurence River, past the Canadian Maritime provinces, including Newfoundland and back down the coast and back to the CT River where they began their trip. This is Judy, Jim and me. It was nice having them with us. On Monday evening, the final night of the event, about a dozen of us attended the Sea Shanties at the nearby Griswold Inn just up the street. The “Gris” as she is known locally, is a very pretty colonial period inn and restaurant that is very popular with locals and visitors alike. All decorated with her bunting she surely looks the part of a country inn. 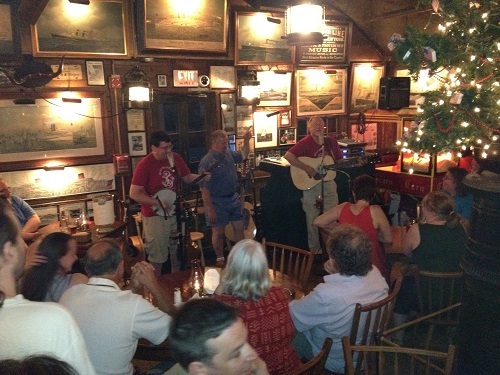 The Gris hosts sea shanties every Monday night, year round. It’s worth a visit but be prepared for standing room only, and on a Monday night of all nights. During the weekend some visitors took in the local Essex Steam Train, a great thing to do when you are in town. The cars are very well maintained and this one in particular, well appointed. All and all, the weekend was a terrific time. I couldn’t be more pleased with how it all worked out. So happy, in fact, that we will be doing it again next year, probably over the weekend of June 21st. So, now back to work on Pandora who is supposed to come out of the water today. On top of that, I have a patio to build for Brenda and there are a few more cruisers in town to take to the market. Whew! So much for a retired life of leisure. Where’s my book? I need to sit and read for a while…. Ha!!! Navy 44s in Essex. Form follow function. 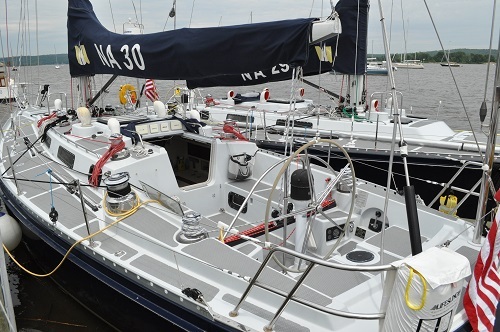 I was thrilled that the Naval Academy brought five of their 44s to Essex Yacht Club for the weekend. It seems that they were on a training voyage, perhaps a “field trip” up the coast from Annapolis. 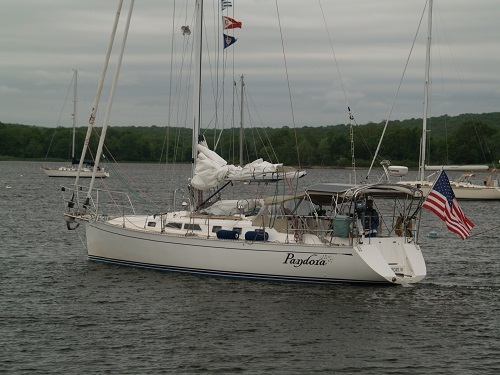 These rugged 44′ sail training boats are part of a fleet of a dozen vessels that they use for cadet training. These are busy vessels, spending some 240 days a year on the water. In an age when designers go out of their way to make boats more comfortable and easy to manage, the 44s are designed to be spartan and labor intensive. Carrying a crew of ten, nearly all amenities are absent from these boats. 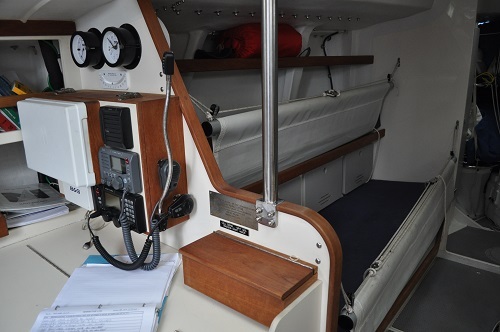 While Pandora is only one foot shorter, she is set up with all sorts of labor saving equipment including auto pilot, roller furling headsails, watermaker and microwave. On the 44s, nada on all counts. The designer, ‘David Pedrick of Pedrick Designs, who have designed winning boats over the years including two successful America’s Cup boats, working with a team from The Naval Academy in Annapolis, went out of his way to make these boats true to their Luder designed predecessors, as simple and tough as possible. 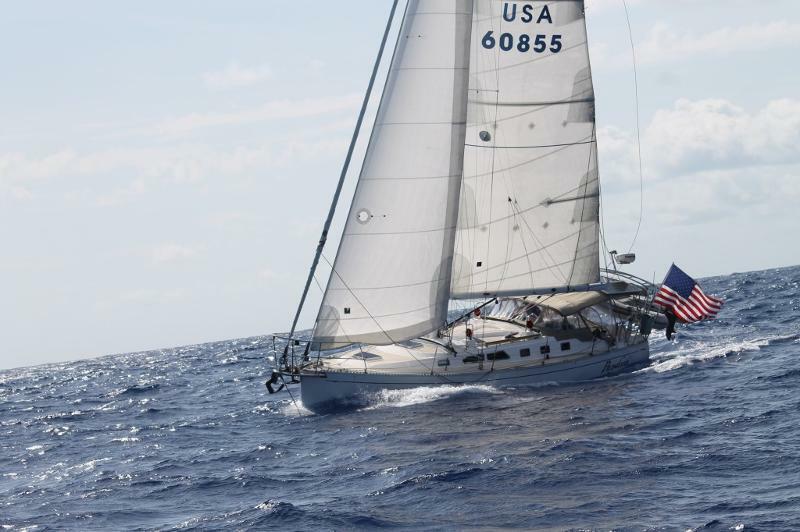 The design goals were described in an article in Blue Water Sailing Magazine. 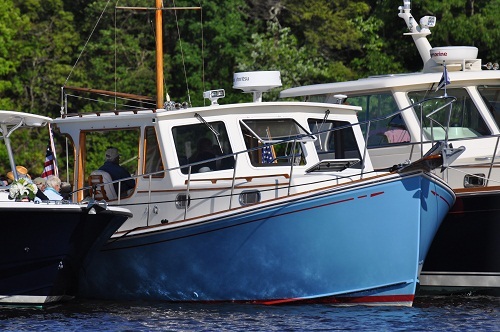 The dozen boats were built in Maine at Morris Yachts, known for their beautifully appointed yachts. While these boats are rugged and simple, they are deliberately designed to be labor intensive to sail as they sport a crew of ten with plenty of bodies to keep them moving. Interestingly, with a relatively short waterline relative to their length, they went with a design that isn’t particularly current. It would be very easy to believe that these boats were designed twenty or more years ago. However, under the skin, these boats are plenty modern with the latest high tech materials. These shots certainly show the dramatic difference between the 44s and the SAGA 43. Not a lot of teak on deck on either design. That’s good. Oops, missing the dodger and bimini too. Not a lot to appeal to Brenda, I’d expect. Ok, how about down below. The 44s have great lee cloths. The crew certainly won’t fall out of their bunks under way. Notice the elaborate lee cloth system, including an aluminum pole, with block and tackle. I believe that the lower bunk can even be hoisted to make it level on the weather side. Pretty nifty. Not great for lounging about off watch however. I am told that they use a two watch system with five below and the rest on deck. Nobody will get lonely on board a 44. Pandora feels cramped with four on deck. Me, at this point in my life I prefer the forward cabin on Pandora. 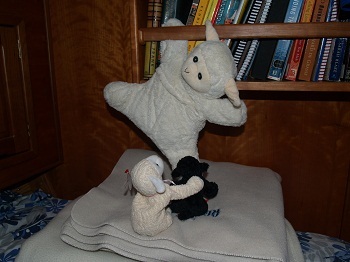 It seems more fun and even Pandora’s sheep mascots enjoy messing around up there. However, spending time aboard Pandora won’t breed the sorts of leaders that the 44s will, I would expect. Probably too much rum. You might say that by working hard, leaders might someday sail yachts, and those sailing on the Navy 44s become leaders who will someday have yachts. With that in mind, the 44s are a good example of form following function. That’s good. Boating with the masses. Er, the other 95%. After my last post about the megayacht Marie, perhaps it is fitting that I write about our great day yesterday where we hung out with the non-megaboating set. Let me explain. In Essex there is a terrific museum dedicated to the preservation of steam trains. The Essex Steam Train Museum is a very popular tourist attraction that draws visitors from all over. 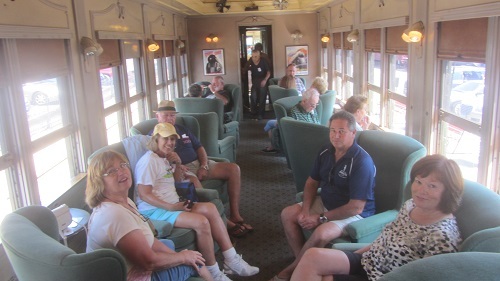 While we did a trip on the train years ago, we have not been aboard since moving to the area a year ago. 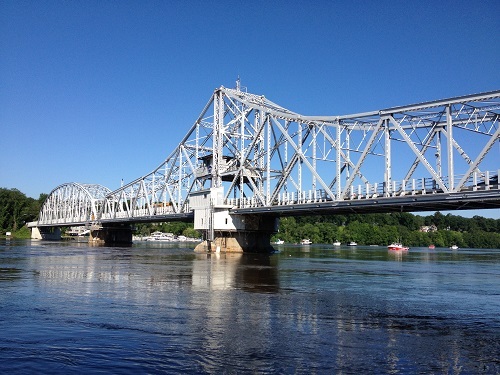 About two weeks ago I was reading the local newspaper, an actual paper newspaper, if you can believe it, how quaint, and saw a notice about a planned 100 year celebration of the swing bridge in Haddam, over the CT River. This opening bridge, with perhaps the longest opening span at the time, was an engineering marvel when it was finished in 1913. Well, it’s now 2013… 100 years, a birthday? Get it? Time to celebrate. 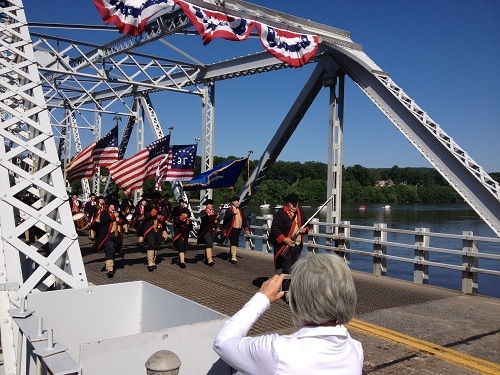 So, what better way to mark the 100th anniversary of the bridge than a run up the river in a historic, and beautifully preserved, steam train, ride in a riverboat and watch a parade complete with fife and drum and antique cars processing across a beautiful bridge? 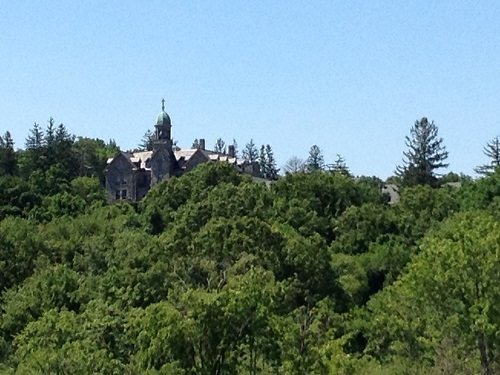 Oh yeah, and on a perfect cool and sunny spring day. What could be better? How about free hot dogs, ice cream, cookies etc? Well, it was all that and more. 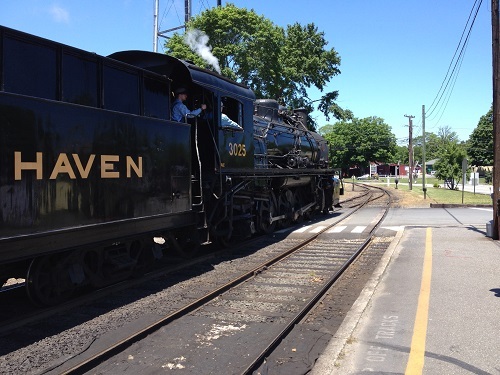 The train in Essex is beautifully preserved, a real classic, and in perfect condition. We boarded the train, and yesterday’s 7:30 AM run was free, to make the run up to the swing bridge dedication. Free makes sense when you think about being out and about by 7:30 on a Saturday morning. We were greeted by the president of the railroad museum. This guy looks totally the part of railroad aficionado. You can easily imagine him bellowing “aaalll aboooard!” (Is that how you spell all aboard? Not sure.) as the train prepares to leave the station. 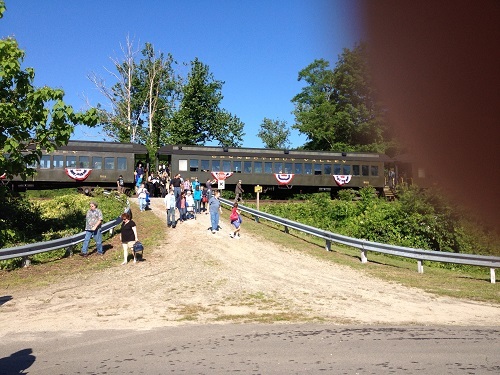 The train, and there are several of them, provide trips up the river valley and connects with the Becky Thatcher, an 80′ Mississippi style riverboat. 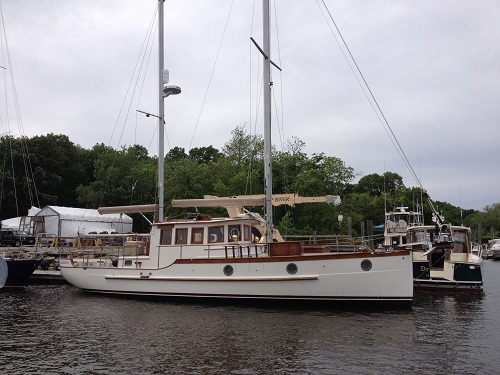 We enjoyed a run from Haddam back down to Deep River, where Pandora is moored for work for several months. 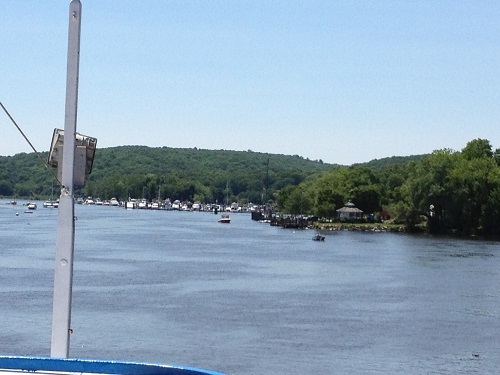 The train took us to East Haddam, home of the Goodspeed Opera House, which just happens to be on the eastern end of the “birthday bridge”. They were celebrating the 50th anniversary of the Opera House, so were happy to get in on the action. The bridge looked splendid with a fresh coat of paint. This area of CT is very serious about classic cars, with a show cropping up what seems like every week. Actually, I am told that there is a classic car meet every Tuesday evening in Deep River that draws 100 or so cars. That’s a lot of meets. Well, a bridge birthday was an opportunity, as good as any, to show up and they did. I thought that this one from Essex, I am told, was particularly nice. Hard to imagine Ford putting out a car like this today. What a beauty. 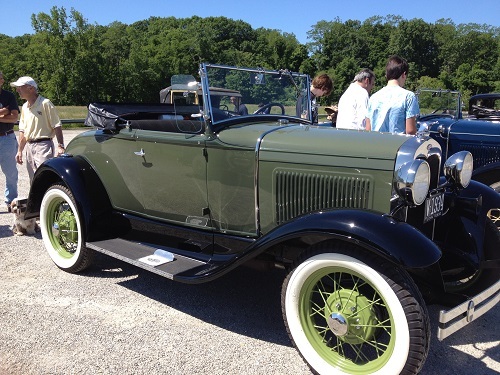 Fords were in abundance, and I loved the color of this one too. It was just so great to see the Fife and Drum corps making their way across the bridge. The drums are so loud, I can only imagine what sort of hearing loss this group must have. Hello? Can you hear me now… at all, even a little? Hello? 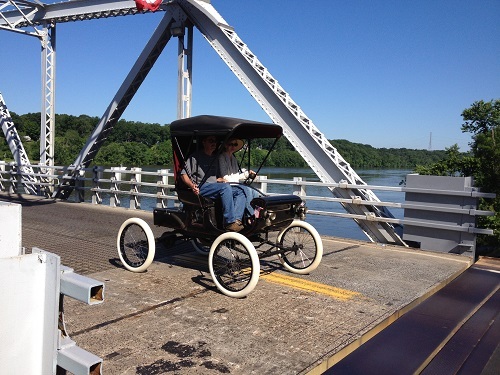 The first car to cross was hardly a car. Well, it even had a tiller to steer with. I don’t know if it was even powered by gasoline. What a classic. This is the lovely Becky Thatcher that we boarded for the trip back down the river. Along the way we spied the train that was crawling along to keep pace with good old BT. 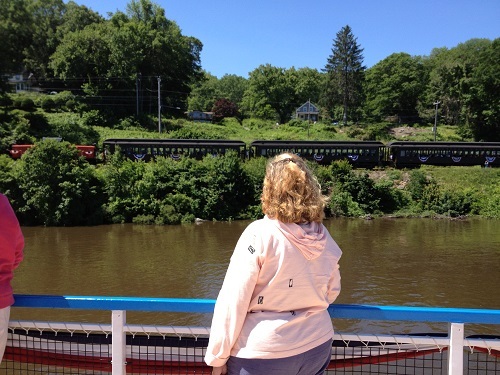 We enjoyed watching the “race” against the steam train to the Deep River landing. 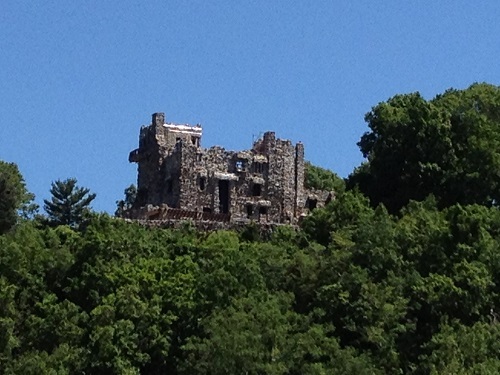 Along the way we passed Gillette Castle, a local landmark that is a great outing itself. Nearly back to Deep River Landing. Pandora’s in the distance. Actually, I should be aboard her working or she won’t be ready for sailing in August. Never mind. Once back on the steam train, we passed lovely scenery on our way down to Essex. We have taken our dink up into this creek for one of our “cocktail cruises” recently. We have seen the train come by and blow it’s horn from the water. It’s nice to be on the train looking out for once. All and all a great time. In spite of it all, we were back home by noon and time for a nap. 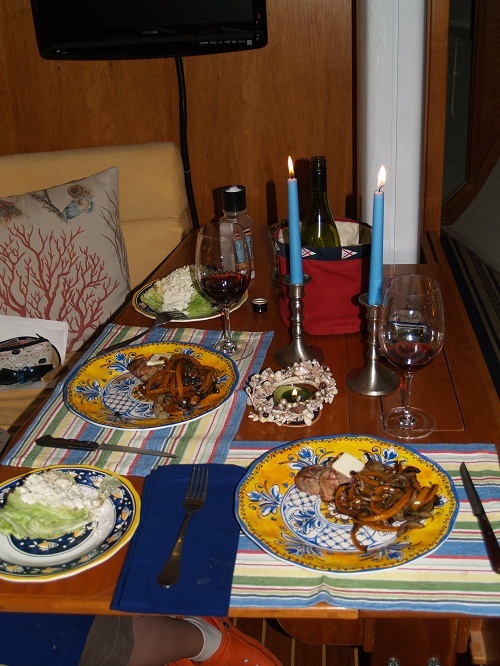 Well, no rest for the weary, as we had dinner guests coming over, by boat. Our third day of entertaining in three days but worth it. Yes, time for a nap. Besides, it’s Father’s day. And, with Pandora out of commission for now, that makes me part of the non boating set, the 95% that don’t own a boat, and the 99.999% that can’t afford a megayacht, for now. It’s fun to mingle with them now and then. “Bob, Bob, have you fixed the leaking portholes yet?” Quit it… I’ll deal with that tomorrow. Remember, it’s Father’s Day. Actually, some might suggest that every day is Father’s Day. True enough. SY Marie, (sometime) resident of The Exumas. It’s Sunday morning and a beautiful day here in Essex and I am not sailing or even on the water. Not yet anyway as I am planning to do a bit of sailing later with my son Christoper on one of the Essex Yacht Club’s Ideal 12 day sailor boats. As usual, I am thinking about sailing. Pandora’s coming along and soon I will begin re-caulking all of the port lights with the hope of arresting some of the leaks that have been plaguing me over the last year. 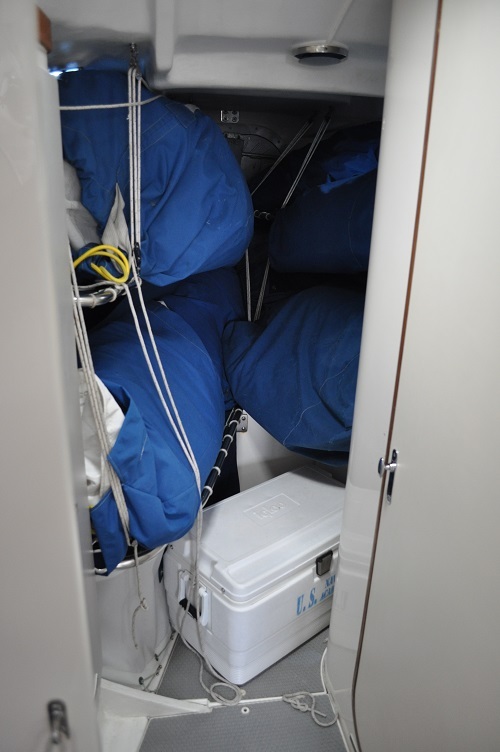 Fortunately, the leaks from what I think are the ports, are behind the scenes and no water shows up in the cabin. However, I know that the leaks are there and need to be fixed as some water is seeping down into lockers. Let’s hope that’s where it’s coming from as removing hardware from the cabin top will be a lot more complicated and I’d prefer not to deal with that. Enough of boat keeping drivel for now. I’d prefer to think about our next trip to the Bahamas. Speaking of the Bahamas, when we were there last winter, we visited a really great anchorage in the Exumas chain, called Compass Cay. This is one island in the chain and is home to a number of privately owned islands including one owned by a guy Ed Borsarge, PhD. I mention him in particular as I saw a profile about him in a magazine ShowBoats International’s June issue. Most issues include a profile of someone who owns a massive yacht. Unfortunately, most are just puff pieces about some gold chain festooned rich guy with more money than taste. However, it seems that Dr. Borsarge, while he must have vast wealth, is also a guy who seems to have taste that is proportional to his finances. For several days I have been trying to find a way to write about one of his yachts, a lovely, huge, ketch Marie but have been struggling on how to make it more than a piece about a big boat. It seems that the good doctor, who’s actually a PhD in physics and math or some such thing, is involved with a museum out of Texas called the Texas Flying Legends. This museum, which he supports, has an impressive collection of flyable WWII airplanes that tour the country to put on airshows. I am particularly interested in this because I grew up with a father that loves the planes of this period. So, what better way to frame a post than to combine a mix of sailing and flying with a dash of The Bahamas tossed in for good measure. So, I learned that Dr. B owns the island Over Yonder Cay in the Exumas. I made the connection because of a reference in the article that he owned an island in the Bahamas that is powered by wind and solar, something that we saw almost no evidence of last winter. You would think that alternative energy would be very popular where there is nearly unlimited wind and sun and there is plenty of both in the Bahamas. However, there are no tax incentives to support alternative energy in the Bahamas as there as there are in the US. I also was told by someone that hurricane damage is not covered by most insurance policies so owners just don’t invest in alternative energy as they fear that their installations will just blow away in the next hurricane. That’s a shame as the wind is nearly always strong and sunny days are the norm. Pandora gets all of her house power for charging the batteries and making water from solar so we hardly ever have to run our generator to bring up the batteries. In any event, his island is totally powered by renewable energy with so much left over that they make something like 20,000 gallons of water per day through reverse osmosis. The wind turbines he has installed on this island are huge, hundreds of feet tall, the sort that you generally see electric utilities put in place, not individual owners. The “compound” and an amazing facility it is, is available for “charter”. The island has it’s own website. It’s worth checking out. There’s a promotional video that’s interesting as well. People having fun. Actually, that would be well heeled people having fun. You might be wondering what it costs to stay there. As they say, “if you have to ask, you can’t afford it”. His biggest yacht, Marie is relatively new and constructed at the Vitters Ship Yard in the Netherlands a few years ago. Check out the yard’s information about Marie. She is truly spectacular with her massive red spinnaker. You can’t miss her in the fleet. This video was shot in St Barts, in the Caribbean during one of the “Bucket regattas”. I believe that the “bucket” is a bucket with ice and champagne that is awarded to the winner of the regatta. Enjoy the tour of Marie. As Dr. B is so supportive of the flying museum that he was able to arrange for an air show at the 2011 Bucket Regatta. I can’t imagine what it cost to pay for these four birds just to fly from Huston to the regatta much less for the cost of crew and support. Oh yeah… If you have to ask, you can’t afford it. Almost forgot.. The St Barts airport runway is known as having a particularly tough approach and to watch these warbirds dive down over the hill and low to the runway is breathtaking. And, as if that’s not enough, how about some shots from a pilots point of view. Remember, Marie has her distinctive red spinnaker. It’s hard to miss. The article also stated that Marie summers in Booth Bay Harbor Maine. I believe that I have seen her there. Actually, I don’t recall the boat specifically but do recall a really large sailing yacht in the harbor with huge signal cannons on board, something that you don’t see every day and yet are on Marie. 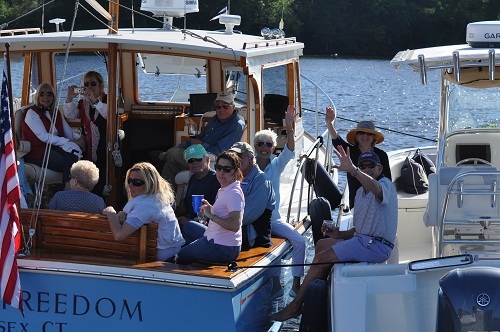 I was thrilled yesterday when I received this week’s installment of Blue Water Sailing’s “Cruising Compass”, an e-newsletter that they send out weekly. I have been a subscriber to BWS magazine and newsletter for a number of years and am just tickled that they chose a photo of Pandora to feature. 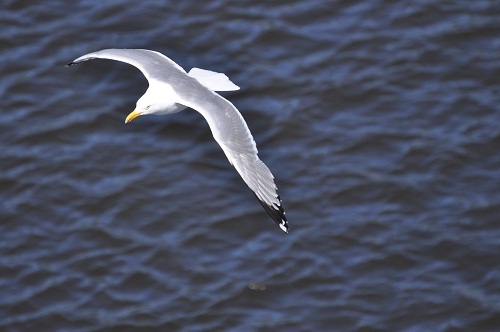 Each week they publish a photo taken by a reader or of a reader’s boat. This is the shot that they used. It was taken by Jay on Take Two. 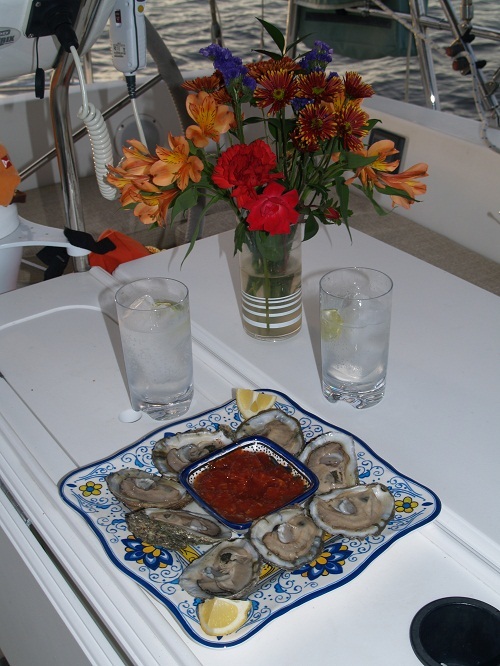 You may recall that Jay and Tanya live aboard the 48′ custom catamaran Take Two with their five, yes five, children. They are a wonderful gang and it was fun to meet up with them in the Abacos. Jay took a number of photos of Pandora as they passed by us (yes, they passed us smartly and it made me nuts) as we sailed from Royal Island at the top of Eleuthera, to Little Harbor in the Abacos. I do take some solace in knowing that Pandora’s bottom looked like the fur on an ape when I cleaned her a few days later. As Pandora’s ablative paint had almost totally ablated, she was pretty foul. Having said that, I expect that Take Two would have passed us anyway, if a bit less decisively, had her bottom been clean. Jay and Tanya keep a very nice blog of their travels. Yes, Take Two is a big boat but seven is a big crew. Quite remarkable and impressive. Their blog is a combination of info about cruising with a “herd” and some interesting recommendations on what works, or doesn’t, on board. A recent post, May 4th, has some amazing shots of water spouts. We had been in the area that they describe when the spout came through but didn’t see it. Not something that I would like to have in my neighborhood. Yesterday, I was able to finish up the interior cleaning of Pandora and she’s back under control. My nature is to have things all neat and tidy. Tidy’s good and Pandora is, mostly, tidy again. Bummer that I still have not found the fresh water leak. Looking under control down below once more. And, if perhaps a somewhat awkward segue, speaking of form and function, I was struck by this lovely motor-sailor in the marina where Pandora is right now for some maintenance. Vagrant is just lovely. She even has a nice round cocktail table on the aft deck. I can just imagine how great it would be to be motoring down the CT River enjoying a G&T while someone else steers from the cabin helm. Classy boat indeed. I’ll have to learn more about her. While she probably won’t win any races. However, she will certainly win some hearts. Function does dictate function and Pandora looks a bit different. Perhaps it’s just me but she does look like she is on the move. Perhaps it’s the river current. In case you are wondering, a G&T tastes pretty good aboard Pandora too. Super yacht er, boat? Well, I think so. So, just how super is Pandora? 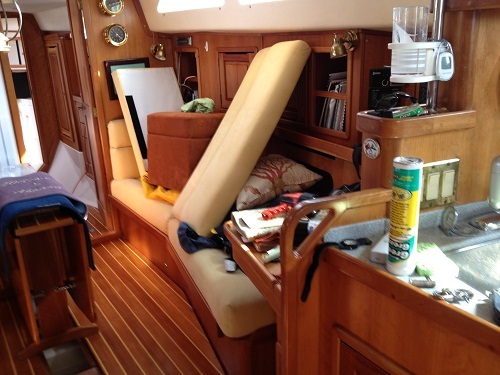 I think she is pretty good and after a day of rooting around in the bilge looking for that &%$#@ fresh water leak, and not finding it, I was struck by the difference in my life verses those with the other folks with yachts that are are mega super. Yes, Pandora is a great boat, er yacht, but I guess that the real super yachts are those over 80′. At least, I think that’s the cutoff. Alas, Pandora is a bit diminutive for that distinction and I am certainly a bit under the pay grade to be an owner of such a machine. However, all is not lost as I pretty confident that I have much more hair than the typical super yacht owner. Good news!!! ‘Coincidentally, yesterday was the first race of the 2013 Loro Piana super yacht regatta in the Med. I don’t recall exactly where in the Med it was and probably wouldn’t be able to spell it if I knew. So, for now let’s just say “the Med”. Anyway, this regatta attracts some of the biggest sailing yachts from around the world. Here’s a link to highlights of the first day of racing. Amazing machines. Nice to have a helicopter to follow you around the course. I’ll bet that the entry fees are pretty steep. But wait, there’s more! They even have winter regatta in the BVI. I can even spell that THE BRITISH VIRGIN ISLANDS. And, I didn’t even have to use spell check. So, some of these yachts, and a bunch of others, competed there too, earlier in the winter. Sorry, couldn’t make it. Pandora was in the Bahamas. Not too many super yacht sailing vessels in the Bahamas as there’s barely enough water to float Pandora with her nearly 6′ of draft. This highlight video has some spectacular footage of the race. Pay particular attention to the amount of hair on the typical owner’s head. No comb overs for the master of Pandora. Yes, I have more hair than most with the possible exception of a few owners, mostly those of Italian descent. Is it the pasta or red wine? Hmm… Note to self, drink more wine! Amazing yachts. Super? You bet. Yes, to me Pandora is indeed super and besides, who wants an annoying crew hanging around all day with constant pestering. “Sir, can I bring you another Gin and Tonic?” Hmm… Perhaps there is something to that. On second thought, super, yes. I’ll have another, James. How about a party in Essex? Pandora is now clearly “non-commissioned” now as she is sitting in a slip nearby in Deep River waiting to be hauled out for some work. Prior to being hauled I am cleaning her from top to bottom with the hope of getting rid of the stale smell that has accumulated from that nasty sewerage leak I spoke about. I am also hopeful that I can, once and for all, find the water leak in the domestic system. I have torn up things to no avail but now I will tear up the entire floor with the hope of finding the leak. I should probably also replace the pressure pump with one with less pressure so that it will not put so much stress on the system. It was the addition of a 50lb pressure pump that caused the problem in the first place. That sort of reminds me of when I had a fish tank when I was a kid. All would be well in the world, the fish tank world that is, and I would go to the pet shop and get a new fish. Inevitably, that new little fish would disturb the equilibrium of the tank or bring in some dreaded disease and all hell would break loose. “What in the world has fish got to do with any of this, Bob?” Oh, got it. The leak start when I installed a higher pressure pump. I wish I had never done that… And, I can’t find the leak. What I mean is that with boat systems, it’s the same. You replace one thing and other problems break out. And, the more complex the systems, the bigger the problems. I am determined to find that leak. And, it’s a trash heap down below. This is how it’s actually supposed to look. Different? And the cockpit, not looking too good today. A bit different than when Pandora was in full live-a-board trim. I like this view better. A women’s touch… What women you ask? Just guess. Yes, you got it. Anyway, there’s loads to do to get Pandora ready for our next voyage. However, in the mean time, how about a party! The Seven Seas Cruising Association (www.ssca.org) has been such an influential group for us over the last few years, I decided to give back to the group buy putting on a GAM here in Essex. On Saturday June 22nd, we will meet for cocktails at the Essex Yacht Club, where Brenda and I are members. 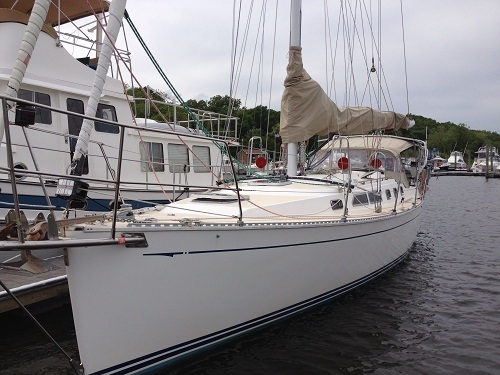 On Sunday afternoon we connect again at the Essex Corinthians Yacht Club, right next door, for a pot luck supper. 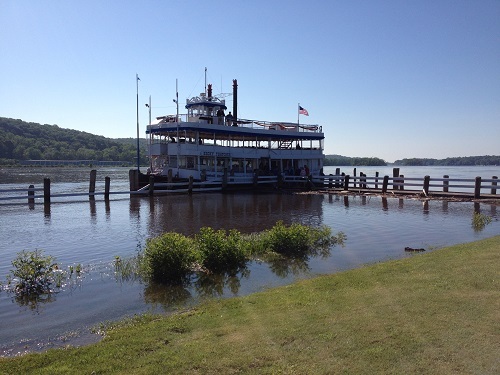 We will also have a speaker who will talk about a voyage up the Hudson River, through Lake Champlain, out the St Lawrence River, around the Canadian Maritimes, back around to Maine and down to the CT River. 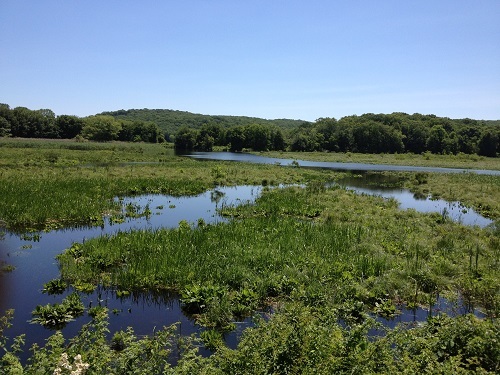 As the trip began and ended on the Connecticut River so how fitting that they should speak to us in Essex. 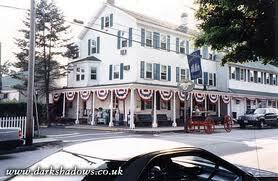 The visit will cap off on Monday with a trip to the Griswold Inn in downtown Essex. 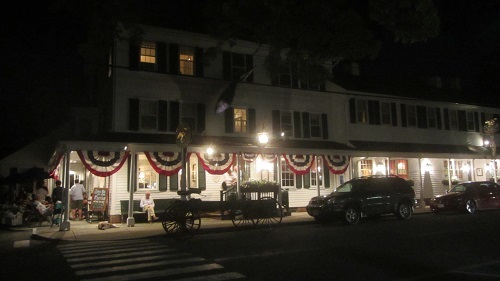 This quintessential New England Inn hosts a terrific trio every Monday evening, the Jovial Crew who will regal the group with sometimes baudy and always fun, sea shanties. Of course, in the SSCA Cruising Station tradition, I will be ferrying folks around town for shopping, laundry and trips to West Marine. Back in shore mode now. That didn’t take long. It’s been only a week since I returned home and yet, in some ways, it seems like much longer. On the one hand, being ashore is so much easier to know that when I turn on the shower it will get hot like magic. It’s also nice to open the fridge and not have to dig down two levels to find cheese that may or may not even be there. Speaking of hard, some of life’s most worthwhile experiences are hard. I’d put cruising in the category of “harder” along with keeping a home beautiful, or at least as beautiful as possible, but both are certainly rewarding. I like splitting time between time on the water and time on the hard. However, that’s definitely a lot harder than choosing one or the other. I also had a problem with the maserator pump that empties the aft holding tank. It sprung a leak and sprayed sewerage all over the cabin and into the bilge. That was one of the “hard” things about cruising that I was referring to. As you can imagine, it’s hard to get THAT smell out of the boat so a lot of cleaning and liberal amounts of bleach will be necessary to fix that problem. Fingers crossed that it’s enough. It’s amazing how dusty and dirty a boat gets when it is used month after month. Pandora will certainly be happier with a complete cleaning. Brenda too… Just to be clear, I didn’t mean that Brenda needed a cleaning herself. Never mind. 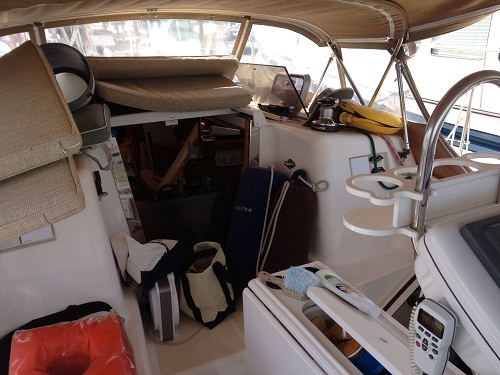 Someone told me that to cruise for a year aboard puts as much wear and tear on a boat as ten years of weekend sailing. I believe it. 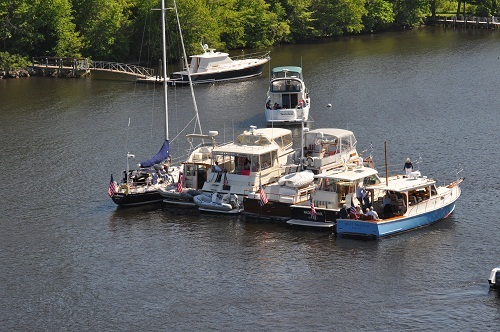 Prior to hauling Pandora we went for a last “sail” a short motorboat ride over to Hamburg Cove, on the CT River for Memorial Day just after my arrival. A number of boats from the Essex Yacht Club rafted up for cocktails. We joined them and had a great time. Our son Christopher took a ride up to the top Pandora’s mast and took some great photos. Mast climbing has been a favorite pastime for Chris for a long time. Now that he’s in his 20s he hasn’t lost interest. It’s a good thing that we have an electric winch now that he’s a lot heavier than when he was eight. Chris took a lot of photos and stitched this great panorama together. Pretty talented photographer. Trust me on this, even if I am his dad. Dad’s know such things. The folks from EYC began to arrive. Pandora wasn’t in the raft up as we needed to leave early and didn’t want to disrupt things. However, a bit away from them, Chris was able to take a photo of some of the boats from the club. Years ago we used to raft up regularly but not any more, or at least not in the areas we have been cruising. It’s easier to just anchor and dink over to another boat. Besides, if we get hit by someone’s wake it can cause boats to crash into each other if they are rafted up. Not a good thing. I am told that the blue boat on the end in the upper photo used to be Billy Joel’s. He has great taste in boats. She’s a beauty. Billy Joel owns a lot of boats and all are really nice. Interestingly, there was a news segment on the Today Show about him and his boats. Alas, the blue one wasn’t featured. It’s worth looking at. Great boats and a decent guy, it seems. 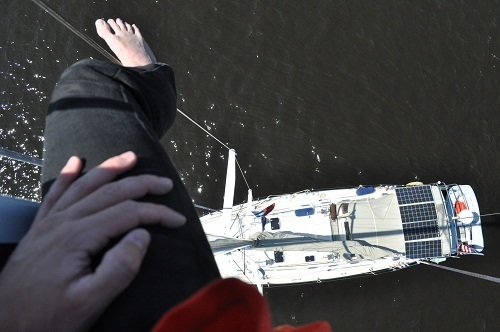 So back to our Chris, 65′ up in the air at the top of Pandora’s mast with a completely different vantage point up there with the gulls. It’s not often that you take photos of the tops of flying birds. Pretty interesting angle. Bummer though that no bald eagles stopped by while Christopher was at the mast head. Perhaps next time. Friends from EYC enjoying the wonderful afternoon. Say “cheese”. Looks like fun and it was. 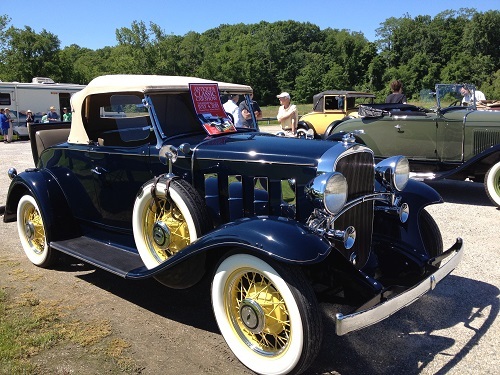 We plan to go to a rendezvous in Watch Hill next weekend but will do so by car. Our aquatic visits will have to wait till August when Pandora goes back in the water. Blog posts Bob? Not to worry, I have loads of material that I can drone on about so I’ll continue to post regularly. Any suggestions? Let me know. Oh well, house chores beckon so I’d better sign off for now.